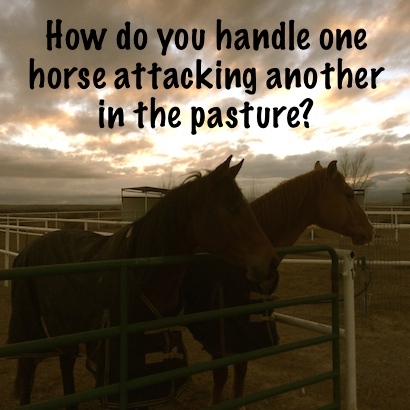 My non-blanketed horses are attacking the two with blankets…What can I do? “I’m having an issue today. I need help if you find a moment. I have 7 horses turned out together. They have ALL lived together for at least a year. Today, I blanketed two if them due to incoming inclement weather. One has a cold and the other was clipped and hasn’t re-grown his coat as well as we hoped. My problem is, the non-blanketed horses are attacking the two with blankets. Not a little either. They are full out ATTACKING. Pawing, rearing biting, kicking . It’s rough. What can I do?”-Patti C.
Horses have an interesting way of viewing things…don’t they? The easiest and quickest suggestion is to separate them for now. Depending on your set up you could pasture them in view of each other which will also allow the non-blanketed horses to adjust to seeing their friends wearing blankets. I am in a situation where I am not able to stall my horses so I must feed them together. I have a piglet that is very aggressive to the other horses at feeding time. She was causing dangerous situations and my personal mare was dropping weight because she wasn’t able to eat. Our solution, since separating her wasn’t possible, was to place their buckets far apart and to stand guard. Our piglet has improved to finishing her meal and staying at her feed bucket and on good days she finishes and walks away to the hay. It took about 3-5 days of standing guard with a stick and now simply our presence is enough to deter her from “attacking” the others for their feed. Still occasionally, if she thinks we aren’t paying attention, she will mosey over and “share” feed but she no longer attacks the others. Generally, horses eventually get over the shock of seeing the other horses with blankets but the important part is to keep everyone safe during this transition period. ← My horse is a hard keeper. He is a very picky eater and won't eat his feed. Help! you could also spray a light coat of vinegar on the outside of the blankets. the attacking horses will not like the taste of the sprayed vinegar. Vicks might work also. just try a little bit at a time. Had a friend’s gelding that hated a mare and would attack her viciously. I fastened a dog-training (shocking) color around his neck with some odds of straps. When he attacked I pressed the button. Years ago. I think it took only 2 sessions and he left her alone. good idea, just be very careful of the weather when you do.